Native Americans subscribe to a principle known as The Seventh Generation philosophy. Many of our societal problems most likely wouldn’t exist if this was common thinking. What it says, in short, is that if we thought in terms of the people that will come after us – 7 generations after us – our responsibilities would be focused on leaving our communities (and world) just as good, if not better, than the way we inherited them. If you have children, you’re probably operating on a Second or Third Generation philosophy…your focus starts to wane after that. In our lives, the best we can hope for is to leave a legacy behind that our next generation can learn from, pick up from and emulate after. Unfortunately, too many of us are working towards someone else’s legacy and not leaving anything substantial behind. 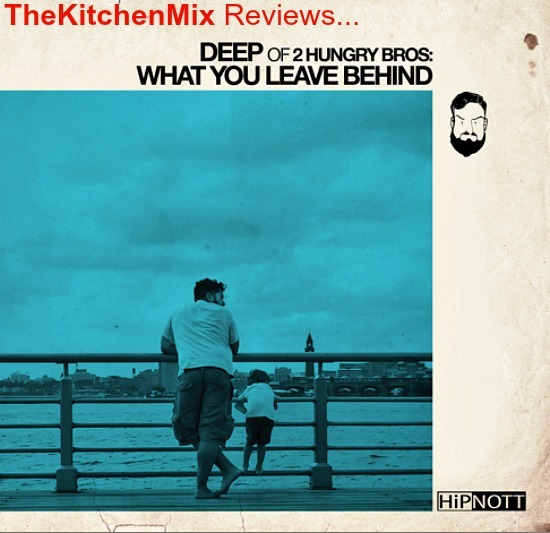 Not the case with producer and sample-and-chop-king Deep, of 2 Hungry Bros. With his first solo outing on a full length project, Deep attempts to leave something behind for the first of his 7 generations. What We Leave Behind is “the legacy Deep is leaving for his son and all lovers of Hip Hop music.” 25 instrumental tracks that serve as the theme music to his experiences growing up in New York’s Lower East Side. It’s the soundtrack to the narrative that Deep will fill in for his son when the time is right. For now, this collection of beats can serve as the music to your daily operations – later generations can do what they will with it. A lot of times in Hip Hop, artists will drop a stellar project and fans will immediately request an instrumental version of said project. In this case, I’m putting in my request to hear what these cuts would sound like with the likes of Homeboy Sandman or Substantial or a dozen other MC’s rocking over them. This is the perfect music for preparing meals for your favorite people as well as your daily commutes. For creative types, it’s great for that artistic flow. I was sold from the opener, “Blue Effy.” It’s a simple lo-fi layering of samples over a straightforward beat. Basic. I keep telling people, less is more when it comes to production. It’s more about what you’re putting together and how you combine those elements than how much of it you add to the mix. I like omelets but some of the ingredients should go into it and some should be left on the side. Deep does a great job of adding just enough elements that should be served together and saves the rest for other tracks. By the second track, you’re thinking to yourself if the rest of this album is this dope, everyone’s getting this as a stocking stuffer this year. And let me just say – pre-orders are happening now and supplies are limited. You’re taken through several styles and moods throughout; sometimes your head’s nodding and sometimes you neck is snapping. Whether it’s choppy and experimental or funky and boombastic, there’s something on here for all levels of head movement. You don’t get many switch-ups – they’re pretty straightforward for the most part – as most of the songs are one and two minutes long. If there’s something to nitpick in a project like this, the same would have to be said for Donuts and any other multitude of beat tapes that have made their way across the globe – and that’s the fact that with these songs being so short, there’s no time to create a conclusion and so most are cut short. Literally. “Gouverneur Gardens” doesn’t even complete the sample loop before it’s cut off. But what are you gonna do? What was taken up in the space in between is pretty dope 25 out of 25 times. I’m very impressed with What You Leave Behind. And that’s not just lip service. I’ve purchased just about every project that 2 Hungry Bros have had a hand in and they’re all worth your time and money. But this collection of beats is an excellent way to maneuver through your daily grind or accompany you as you add to your own legacy. Apparently, each song represents either a time or place in Deep’s L.E.S. experience but I’m more impressed with the assortment of musical pieces than I am with their deeper meanings. I know, I know…it’s important to know about the reasons behind the art but, this is now the soundtrack to my own 7 Generation game plan. Head over HERE to pre-order your copy on cassette or CD and get on your hustle. You owe it to those coming after you. Here’s a sample to hold you over until the December 11th release date reaches us.